Human P-Selectin, Fc Tag (SEP-H5255) is expressed from human 293 cells (HEK293). It contains AA Trp 42 - Ala 771 (Accession # AAN06828). The protein has a calculated MW of 106.6 kDa. The protein migrates as 146-160 kDa under reducing (R) condition (SDS-PAGE) due to Glycosylation. Human P-Selectin, Fc Tag on SDS-PAGE under reducing (R) condition. The gel was stained overnight with Coomassie Blue. The purity of the protein is greater than 95%. 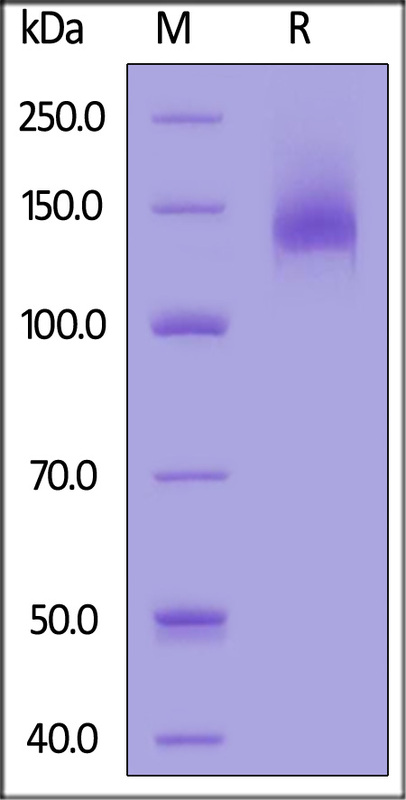 P-selectin (SELP) is also known as CD62 antigen-like family member P, granule membrane protein 140 (GMP-140), leukocyte-endothelial cell adhesion molecule 3 (LECAM3) and platelet activation dependent granule-external membrane protein (PADGEM). SELP functions as a cell adhesion molecule (CAM) on the surfaces of activated endothelial cells, which line the inner surface of blood vessels, and activated platelets. In unactivated endothelial cells, it is stored in granules called Weibel-Palade bodies. In unactivated platelets SELP is stored in α-granules. The primary ligand for SELP is P-selectin glycoprotein ligand-1 (PSGL-1) which is expressed on almost all leukocytes, although P-selectin also binds to heparan sulfate and fucoidan. Furthermore, SELP has a functional role in metastasis of tumor similar to E-selectin, which can help cancer cells invade into bloodstream for metastasis and provided locally with multiple growth factors respectively. (1) Pouyani T., et al., 1995, Cell 83:333-343. (2) Wilkins P.P., et al.,1995, J. Biol. Chem. 270:22677-22680. (3) Kerr S.C., et al., 2008, J. Immunol. 181:1480-1490.